McDonald’s will not only host the Hoopa distribution event later this month, with toys promoting Pokémon Omega Ruby and Pokémon Alpha Sapphire to be available in the fast food chain’s Happy Meals. 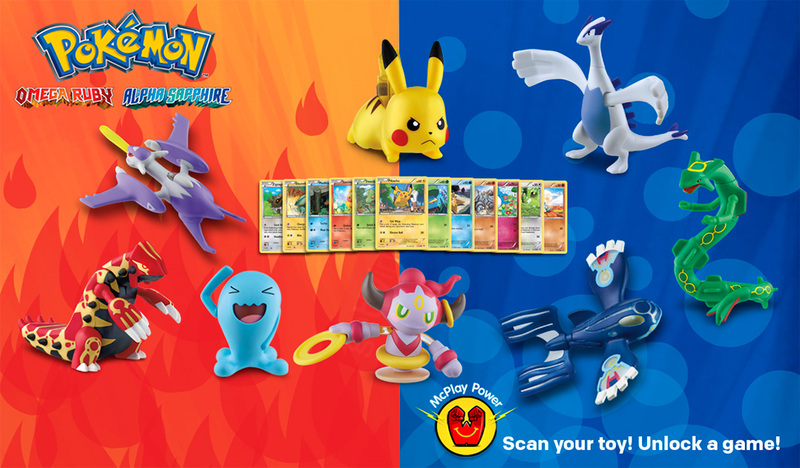 That will see several toys become available, including Hoopa, Primal Groudon, Primal Kyogre, Rayquaza and Pikachu, while 12 Pokémon Trading Cards can also be collected. These will be added after the current toy range promoting The Peanuts Movie are removed, presumably to coincide with the Mythical Pokémon’s distribution between 27th November – 23rd December 2015. Those looking to claim Hoopa will be required to bring their Nintendo 3DS, and copy of either Pokémon X, Pokémon Y, Pokémon Omega Ruby or Pokémon Alpha Sapphire.